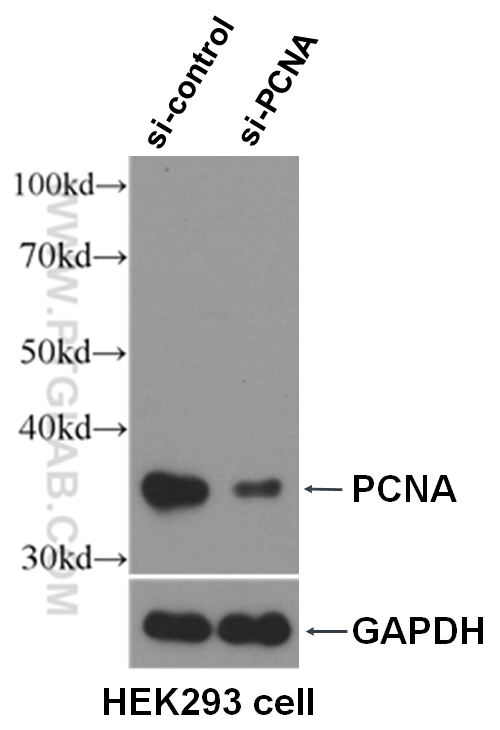 WB result of PCNA antibody (10205-2-AP, 1:10000) with si-control and si-PCNA transfected HEK293 cells. IP Result of anti-PCNA (IP:10205-2-AP, 3ug; Detection:10205-2-AP 1:1500) with MCF-7 cells lysate 2500ug. 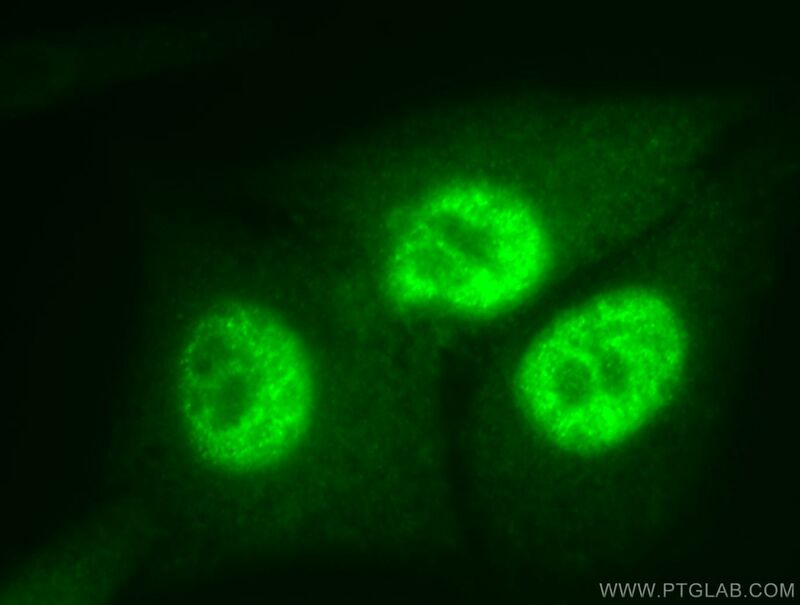 Immunofluorescent analysis of HepG2 cells, using PCNA antibody 10205-2-AP at 1:50 dilution and FITC-labeled donkey anti-rabbit IgG (green). 1X10^6 HEK-293T cells were stained with .2ug PCNA antibody (10205-2-AP, red) and control antibody (blue). Fixed with 90% MeOH blocked with 3% BSA (30 min). Alexa Fluor 488-conjugated AffiniPure Goat Anti-Rabbit IgG(H+L) with dilution 1:1000. Proliferating Cell Nuclear Antigen, commonly known as PCNA, is a protein that acts as a processivity factor for DNA polymerase δ in eukaryotic cells. This protein is an auxiliary protein of DNA polymerase delta and is involved in the control of eukaryotic DNA replication by increasing the polymerase's processibility during elongation of the leading strand. PCNA induces a robust stimulatory effect on the 3'-5' exonuclease and 3'-phosphodiesterase, but not apurinic-apyrimidinic (AP) endonuclease, APEX2 activities. It has to be loaded onto DNA in order to be able to stimulate APEX2. PCNA protein is highly conserved during evolution; the deduced amino acid sequences of rat and human differ by only 4 of 261 amino acids. PCNA has been used as loading control for proliferating cells. 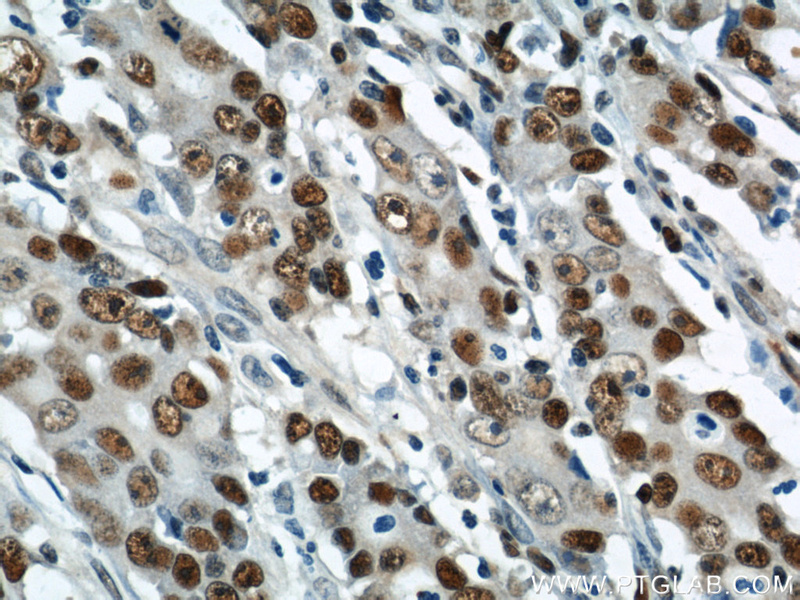 This antibody is a rabbit polyclonal antibody raised against an internal region of human PCNA. The calculated molecular weight of PCNA is 29 kDa, but modified PCNA is 36kDa （PMID: 1358458）. miR-210 has an antiapoptotic effect in pulmonary artery smooth muscle cells during hypoxia. Long Non-Coding RNA LnRPT is Regulated by PDGF-BB and Modulates Proliferation of Pulmonary Artery Smooth Muscle Cells. Epigenetic regulation of NOTCH1 and NOTCH3 by KMT2A inhibits glioma proliferation. Sub-cytotoxic concentrations of ionic silver promote the proliferation of human keratinocytes by inducing the production of reactive oxygen species. 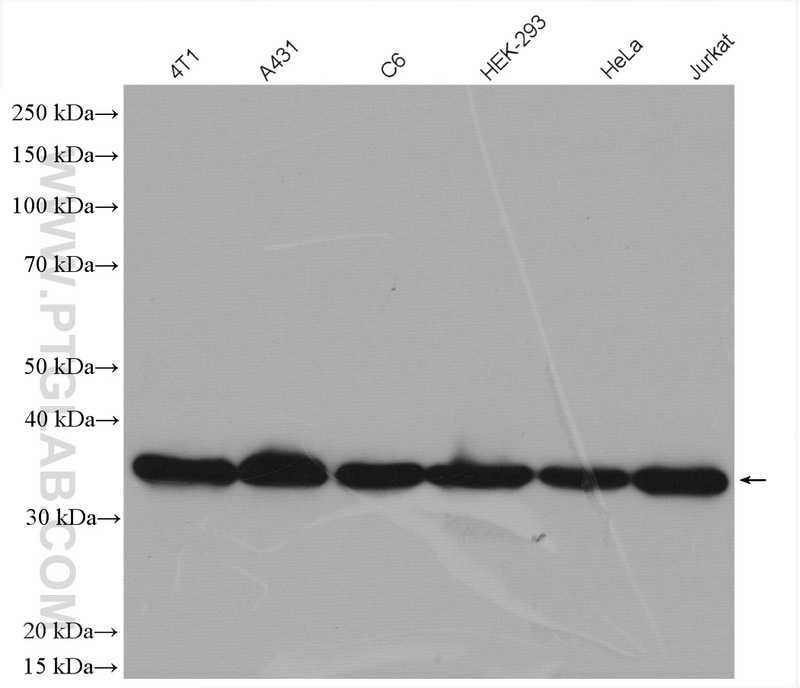 DL-3-n-butylphthalide alleviates vascular cognitive impairment induced by chronic cerebral hypoperfusion by activating the Akt/Nrf2 signaling pathway in the hippocampus of rats. 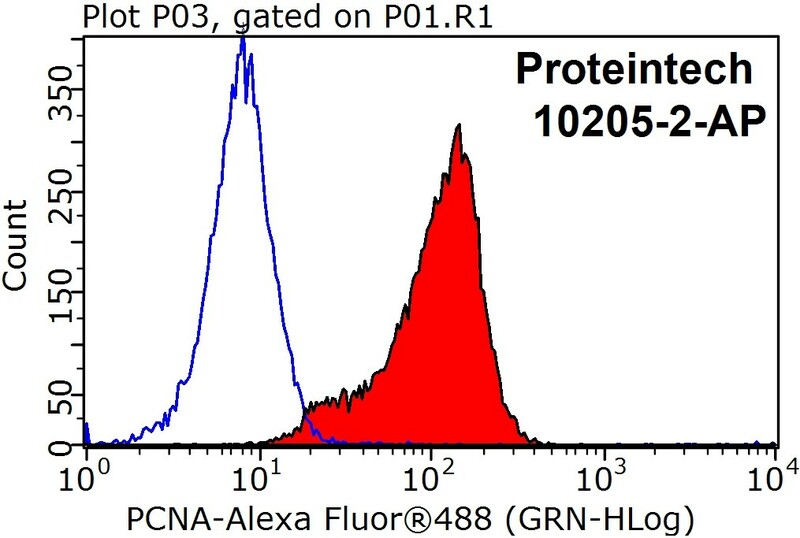 IP result of anti-PCNA (10205-2-AP for IP and Detection) with MCF7 cell.